I’m always amazed at the clever ingenuity of non-profit organizations and public health agencies that focus on disease prevention. They typically have a long list of ambitious objectives, and a short list of resources to help accomplish them. They are often tasked with communicating complicated messages that are of great importance, but are not nearly as entertaining as the flashy campaigns we see for popular consumer products. That is why I’m excited about the various entries in the Awesome Disease Prevention Project Contest that PKIDS (Parents of Kids with Infectious Diseases) is currently sponsoring on Facebook. Not surprisingly, the recurring theme of each of these entries is one of community awareness. While the projects are designed to be engaging to a variety of audiences, they all illustrate various ways that we can help educate people about disease prevention. There are two specific programs that I am personally excited about due to my education efforts here on Shot of Prevention. The first is a program suggested by the Autism Science Foundation that will help to eliminate the disturbing trend of reduced immunization uptake among younger siblings of children with autism. The second is the Shot By Shot program which captures personal stories of vaccine preventable diseases and is a wonderful example of how immunization advocates are collaborating in their educational efforts. Shot by Shot has been effective at connecting the resources of various organizations and compiling the media into a comprehensive story library that can be utilized by immunization advocates around the world. The stories not only help to educate people about the dangers of various diseases, they also reminding people about the value of prevention. In hopes of raising awareness about vaccine preventable diseases both here in the US and abroad, the National Meningitis Association (NMA) is teaming up with local day care facilities to bring the message of hope to our children. In their “Hop for Hope” event, the NMA will provide a donation to the Shot@Life campaign for each “hop” by a participating child. There are also a number of programs that are targeted to middle and high school students. For instance the “Save a Life – Start With Four” project out of Missouri is a health messaging campaign that is tapping into the popularity of social media and Facebook to encourage students to reflect on the importance of immunizations. The “Vaccinate Before You Graduate” program, from The Northern Nevada Immunization Coalition, is trying to educate high school students about the importance of HPV, meningitis, Tdap and influenza vaccines by empowering them to advocate for their own health as they make preparations to head off to college. Some projects are specifically targeted at the parents of newborn children, such as the KICK Packets (Keeping Immunizations Current for Kids). By providing educational materials to parents at a critical time, they hope to encourage them to follow routine and timely immunizations for their children. Of course, doctors are important partner in our efforts to increase immunization coverage, which is why the Arizona Partnership for Immunization is recognizing outstanding medical practices that make exceptional efforts and apply innovative strategies to improve immunization rates. They’ve even created a new program specifically targeted to immunizing teens as reflected in their newly proposed Teen Award. The entries also include several programs that specifically focus on flu prevention, such as Flu Ready Kits created out of “Project Love” from the Columbus, Ohio public health agency, the “I’m Protected” stickers proposed by the Childhood Influenza Immunization Coalition, and the Control Flu project which is currently supported by various organizations in Florida. 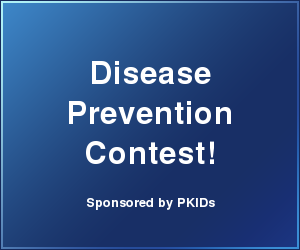 One again, PKIDS has done a fabulous job at generating some well deserved attention for these disease prevention programs through this contest. I applaud them, as well as the many organizations that have submitted entries, and I encourage our readers to take some time to find out more about these innovative programs. If we can just get one child to be immunized, one teen to understand the importance of vaccines before college, or one parent to be properly informed about the need for timely immunizations, than these programs will all have succeeded. Please do what you can to support these programs by sharing them with others and voting for your favorite. I like the Cry for Vaccine Freedom Wall at the NVIC site that captures personal stories of vaccine tyrants and serious reactions and showcases how against reporting events pediatricians actually are, further showcasing how under-reported serious vaccine events are at VAERS. When pharmaceutical companies are in the short list, a short list is all you need. When you have an industry that has no problem spending $250 million/year lobbying at the federal level, you have money to burn, lots of it. When you spend $250 million/year lobbying at the federal level alone, you can influence government policy and safety trials be damned. @Richard – I like the graveyard tours where the tombstones of all of the children that died before the age of 5 of vaccine preventable diseases…..or tours of old hospitals where you get to see the dis-used iron lungs. Thanks for talking about these wonderful groups, Christine. We’re excited to see the various ideas. Hope even more folks enter so we can all see who’s doing what and help a group reach their goal. Susan Martin from AAP and Katlin Smith from UrbanWordsGroup are two of the judges – three finalists are chosen by the judges, then the public votes for the winner.